Putah Creek originates from springs high above Cobb Mountain and meanders downstream from Lake Berryessa to the valley floor. It is one of the few wild trout streams that is coming into its prime. 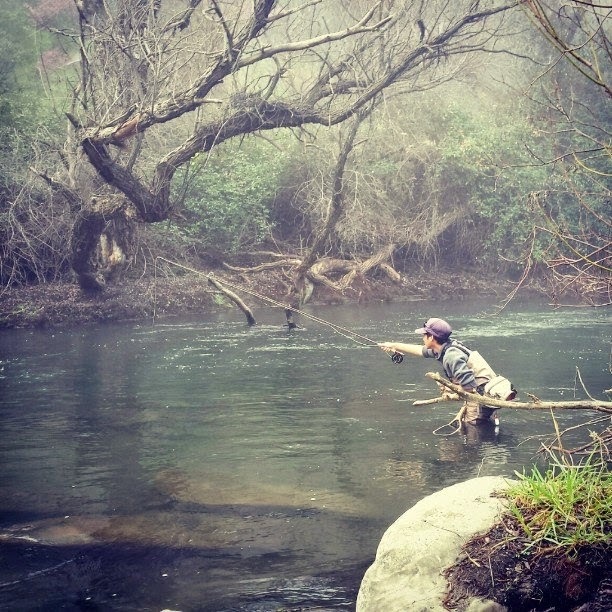 Putah Creek is a relatively short 4.5 mile tailwater fishery that runs below Monticello Dam. 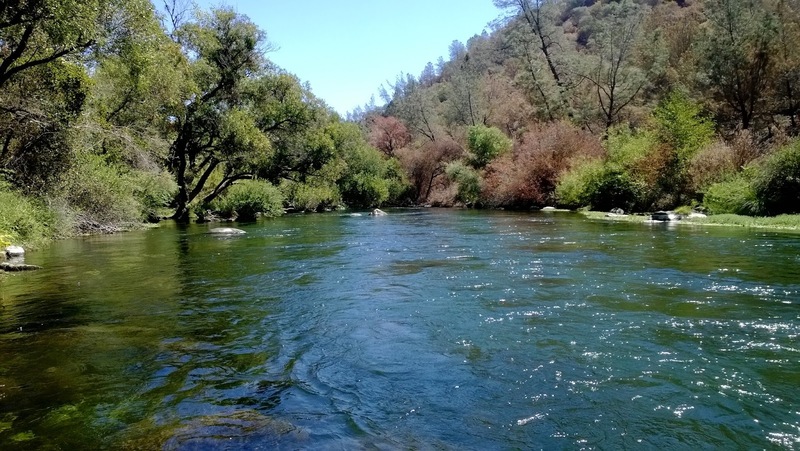 Famously named the "Green River" by the Clearwater Credence Revival, the nutrient rich waters of Lake Berryessa create a habitat for trout unlike any other within California. Prior to 2010, Putah Creek was managed as a put-and-take fishery. 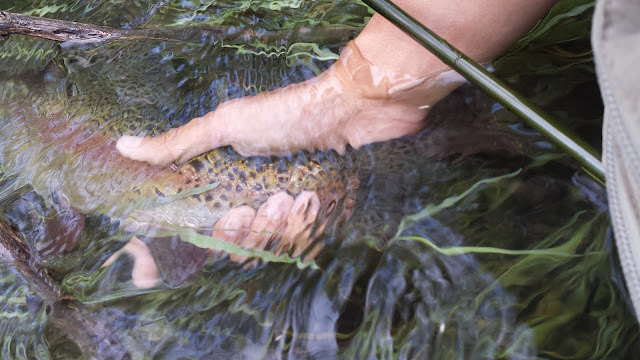 Past pictures and stories of trophy brown trout continue to circulate the internet however, the fishery has drastically changed since its designation as a wild trout fishery in 2014. 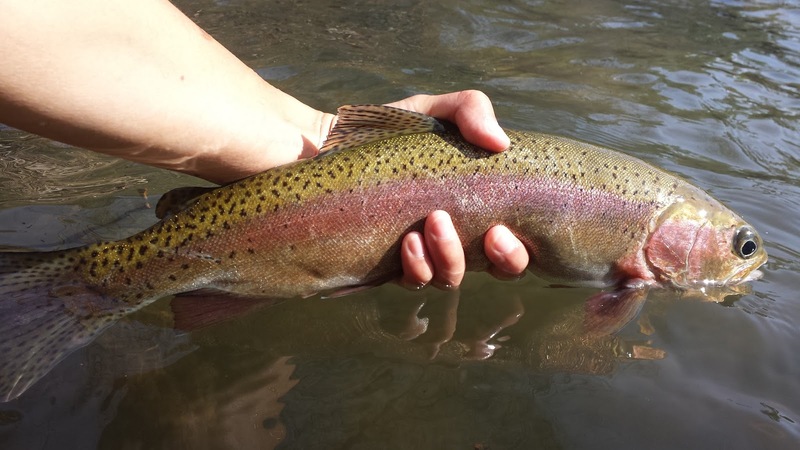 Instead of brown trout, which no longer occupy the creek, a self-sustaining population of wild rainbow trout have become the dominant fish in the Putah Creek system. Putah Creek is well-known as a technical fishery. Fluctuating flows, submerged trees, weedy bottoms, overhanging branches, tight fishing quarters, deep runs, and thorny blackberry bushes are just a few of the many elements that contribute to the creek's notorious fishing difficulty. 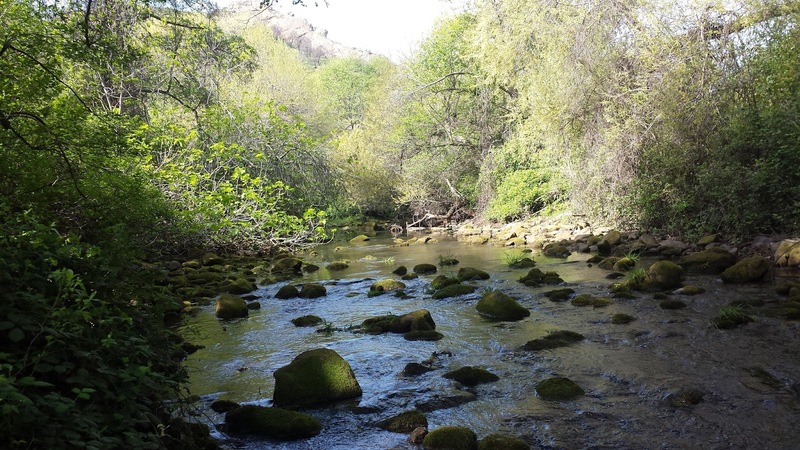 Although these elements create a great habitat for growing giant trout, they can puzzle inexperienced anglers who are not familiar with the creek. 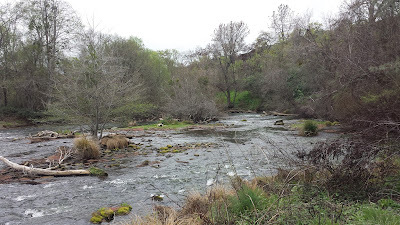 Putah Creek is one of my favorite streams to fish because it is a high risk high reward fishery. Putah Creek is a jungle, welcome to the jungle. A) From Lake Solano to Monticello Dam. There is an unwritten rule to not fish the creek from December through February. These fish are winter spawners that have very limited spawning habitat. Please respect this amazing fishery and leave the fish alone during the spawn. There are several fishing access points with parking lots along HWY 128 in addition to turn offs. There is no fee to park with exception of Lake Solano. The first access point is the Putah Creek Wildlife Area. There are two undeveloped parking lots about a mile downstream from Monticello Dam. This section contains the most varied water. 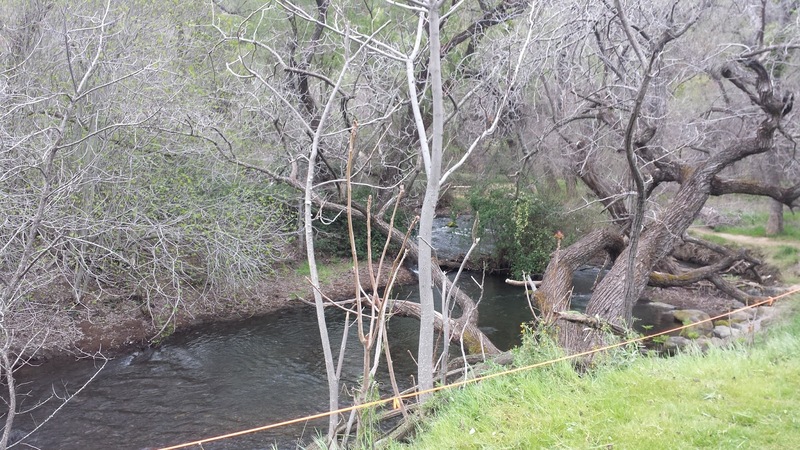 Riffles, runs, and pools both deep and shallow can be found all throughout this section of Putah Creek. Continuing downstream you will find the Canyon Creek Resort which is a private stretch of water only accessible by occupants. Once you pass the Canyon Creek Resort keep an eye out for a deer sign along the creek. There is a short turnout where you can park in the section cleverly known as "Deer Sign". The first type of water you'll see upon hiking towards the creek is a long deep run. Below the run there are a few riffles, runs, and pools however the access is better if you can cross the creek. The long deep run is crossable in certain areas at flows below 200 CFS or you can hike down to it from the Putah Creek Wildlife Area. Fishing Access #1 and #2 is the first parking lot access downstream. This section contains deep runs and pools along with a few shallow riffles and runs. Unlike the other fishing access points, access #2 has no parking lot and can be found as you hike downstream along the trail. Fishing Access #3 is the second parking lot access downstream. Some of the deepest runs in comparison to the other access points can be found in this section. The many boulders within this section create excellent habitat that can hold fish when the flows are higher. Fishing Access #4 is the third parking lot access downstream. This section is essentially a long run with a tailout, pool, and run. The run eventually shallows out and connects with access #5. The shallow area is crossable at flows below 450 CFS. Fishing Access #5 is the last parking lot access downstream. The creek wraps around an island creating beautiful riffles and pools in this section. 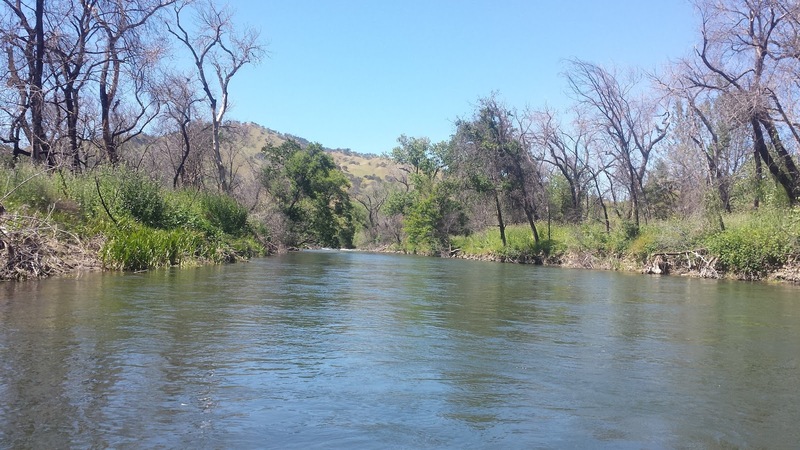 Access #5 is relatively shallow, easily wadeable, and crossable at flows below 500 CFS. Below Access #5 the creek turns into Lake Solano. There is a parking fee at Lake Solano. Try to stay out of the water and if you must cross be aware that there may still be active unhatched eggs within the creek. 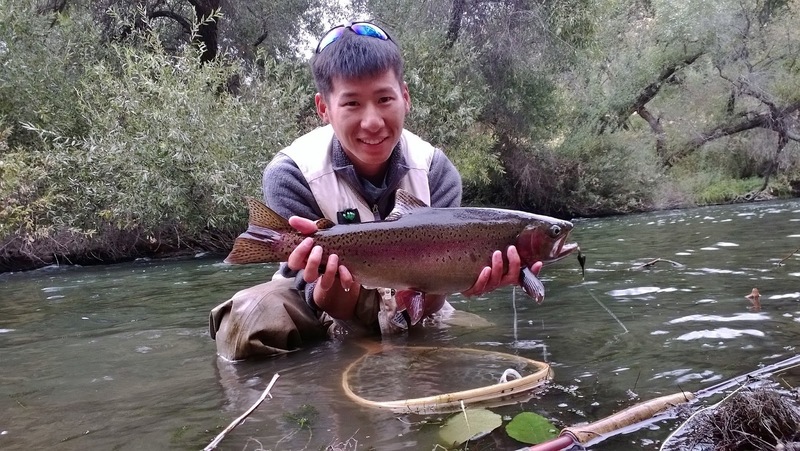 Midges and BWOs are usually the go-to for Putah Creek throughout the year and spring time is no exception. Putah tends to attract crowds during the spring since it is easily wadeable and crossable therefore you will have to think outside the box if you are left with water that has already been fished. The summer flows begin at 400 CFS and tend to peak at 600 CFS. Mornings and evenings will often fish the best. As the weather warms up the caddis will become more active. Patterns that imitate emerging pupae such as prince nymphs or Fox's poopah are a good option. I like to fish Putah Creek with my Hero Sculpin streamer during the summer. You'll need to cover a lot of water but there's a good chance that you'll get a big take from a Putah Creek trophy. The fishing can be tough this time of year but don't let the high flows intimidate you. Fish always need to eat. Similar to the spring tradition of crowds on Putah, the fall is when anglers tend to pick their rods back up and head out to their favorite creek access. The flows will gradually be reduced providing access to areas that were unfishable during the summer. 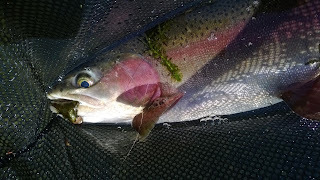 Streamers will continue to work along with nymphs during the fall as the trout fatten up to prepare for the spawn. November 31st is when anglers will stop fishing Putah Creek due to the spawn. Depending on the timing of the spawn some guides and anglers will stop fishing the creek even earlier to help keep this fishery healthy. This ultimately means the end of the season until March. The fish will be spawning during this time. With the creek at minimal flows it is best to avoid fishing to prevent from interfering with the spawn. Leave the creek alone and fish the other great winter fisheries nearby such as the Lower American, Lower Yuba, Feather, and Sacramento River. Nymphing is the most common fly fishing technique on Putah Creek. 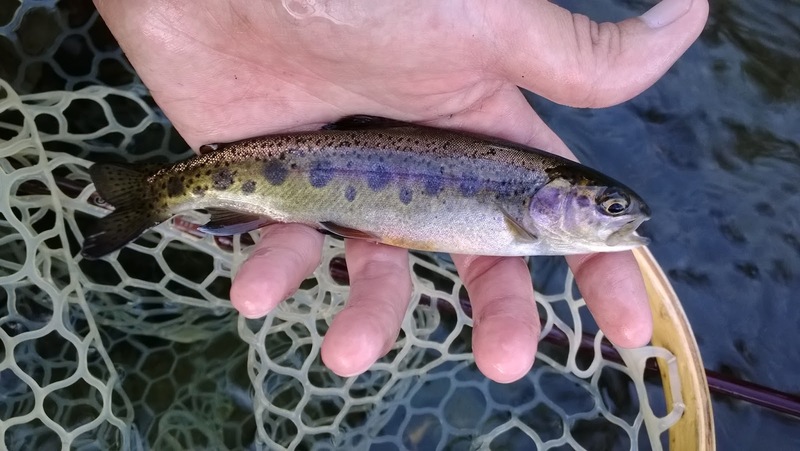 Although smaller fish can be found rising for flies during warm evenings, Putah Creek trout feed subsurface 95% of the time. Surprisingly the trout that live in Putah Creek love to eat tiny flies. The rig I use is an indicator, splitshot, and size 16 nymph along with a size 18 dropper. More often than not I will get a 20''+ fish to eat the size 18 dropper. When the flows are high use a long 10' or 12' 5x leader and a heavy splitshot to get your fly down to the fish. When the flows are low you can often get away with using a standard 9' leader. Adjusting your set-up is absolutely critical when fishing Putah Creek. Change the size of your splitshot or add more on. Adjust your indicator depth. I like to use the air-locking indicators because they can be adjusted quickly and easily. Changing the size and color of your indicator can also make a difference. Extend your leader. The creek is deceptively deep therefore adding more tippet to your leader can help you get down further and faster. Switch out your flies. Size and color are both important. Once I find two flies that work I will rig those flies together. High-sticking can also work wonders when the flows allow it. Check your flies often for green gunk. Fish don't like to eat flies with gunk on them. 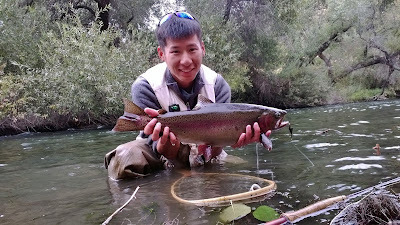 Streamers work very well on Putah Creek when the flows are 200 CFS and higher. I like to use an extra fast sinking 10' versileader with a 4' 10# mono leader when fishing streamers. Cast your streamer, let it sink, and once it begins to swing make steady two inch retrieves. Here are a few more helpful tips on streamer fishing. Cover lots of water when fishing streamers. Landing fish is essentially easier when fishing streamers because of the heavier line. Putah Creek is a jungle creek lined with blackberry bushes and overhanging trees that prevent you from backcasting. Learn to roll cast and roll cast well. Be prepared to fight a trophy fish. 10% of the trout in Putah Creek are trophy sized fish so you'll eventually hook one if you fish the creek often. Fighting these fish can be tough so be prepared with a decent sized net and refined fish fighting skills. You'll lose more trophy fish than you land so keep calm and fish on. I believe that the optimal flow to fish Putah Creek is around 200 - 350CFS (Check flows at Dreamflows). The wading can be a bit challenging but is safe and doable. At optimal flows there are plenty of accessible areas where you can find fish. Any thing in the 100-150 CFS range is too low making it both tough to fish and tough for the fish. Putah Creek has a significant New Zealand mudsnail infestation. To help prevent spreading these invasive snails be sure to thoroughly clean your gear or let it completely dry out for a few days before jumping into another body of water. Thanks for the compliment. I've caught some of my biggest fish out on Putah with streamers. You have to cover A LOT of water but they work well if you stick to them. Most of the times they'll just strike it or chase it but watching a 20''+ bow come out of absolutely nowhere to hit your fly can be half the fun. Very helpful write up, thanks for taking the time to put this together. Is putah creek limited to fly fishing only or can I fish with a barbless lure as well? The regs are barbless hooks and artificials only so a barbless lure is okay. 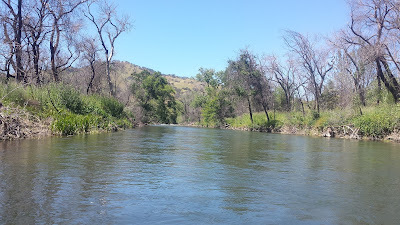 I don't believe there are any bodies of water in California that are fly fishing only aside from private waters.